"I participated in the music workshop because I love to sing and very little makes me happier than when I am onstage performing music for the enjoyment of others. I also was excited to learn a new form of music (barbershop) and add it to my "bag of tricks." "The thing I enjoyed most was the performance as well as learning the "tags" along with many others who enjoy singing as much as I do." "The event definitely increased my interest in that kind of music and I would love to join or start a quartet in the future!" "I have been involved in choirs my whole life, but I have only gotten to dabble a little bit in barber shop even though I have always loved it. This was an amazing opportunity to learn from the best!" "What a GREAT festival, right? I'm still jazzed, and I've already used some of the techniques we learned." "Jenn Edwards was an absolutely amazing teacher. She was able to explain concepts of voice so well and she made the whole process so much fun." "I guess the benefit is getting over the queasiness I get sometimes before a big show. I get better all the time and the crowd out there was really encouraging and Mr. Queasy walked off the stage in disgust. I'm going back next year and bringing a friend too!!!" "I'd encourage just about anyone to do this workshop in the future as it is so good and the ladies are so helpful, nice and enthusiastic. You just have a ball !!!" 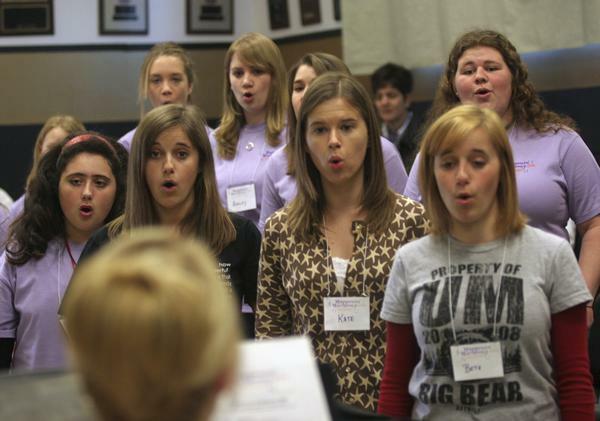 "I enjoyed the barbershop style of singing, and I am even considering pursuing it further throughout my life by perhaps becoming part of a group someday." "Well, at first my grandma kept on encouraging me to go and I was a little skeptical. But, after about 30 minutes of being there, I could tell I was going to have a good time. There were so many enjoyable events that occurred that day. From learning all the songs and choreography to meeting all these new faces, I would have to say working with Jen was my favorite part. She was such a great mentor and so sweet as well as funny. It has improved my singing techniques, as well as, a new perspective. I had such an amazing time and can't wait to go again next year."